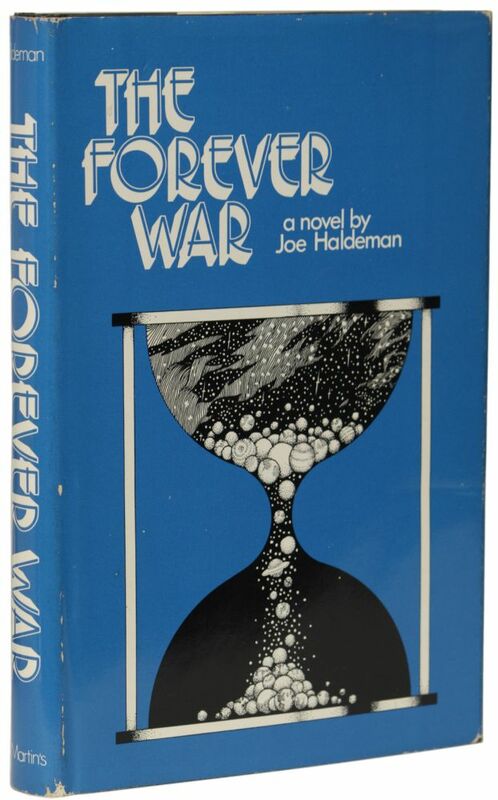 I love Forever War by Joe Haldeman. It is my favourite science-fiction-novel, and I highly recommend everyone read it. I also devoured other Joe-haldeman-Novels, and was, disappointed. After a recent re-read a few of his novels I noticed his style much more than in the past. It’s not just about the prose he writes, but also the elements that seem to occur in every one of his novels. Let’s look at the novels, and then his classic elements. Forever War was made after the jingoistic and militaristic Starship Troopers Novel came out, and take a decidely anti-militarism stance against it. It deals with people being used and abused by an inhumane bureaucratic military machine that discards them in the most unfeeling manner, ripping them from their times and families. It was inspired by Haldeman’s eperiences during the Vietnam War. Spiritual sequel to Forever War. The main character is an academic and soldier controlling a “soldierboy”, a remotely controlled fighter while mind-sharing with several other people. Actual sequel to Forever War. The last human colony tries to start an expedition 40000 years into the future. Works pretty well except for the abrupt ending which introduces the aliens from Camouflage and a literal Deus Ex Machina. A few of the stories are great! One is a collection of four stories all starting with the line “So it became to pass that no-one had to die”, and explore different ways how immortality affects society. Another one (“A Separate War”) ties into Forever War, but due to its short nature it doesn’t really come to anything. The comic-adaption of Forever War is… disappointing. The story and environment suffer greatly from being condensed into a very compact format. Additionaly the visuals are sub-par and boring, and confusing at best. The military moves around in massive behemoth ships, but the landers look like real-world Space Shuttles. The only positive ascept about it is a tiny bit that illuminates the main characters’ status as celebrities when returning home after their first missions, which went less explored in the actual novel. Follows two shape-shifting aliens over the centuries as they navigate living among humanity. An author tries to create a “lost” Hemingway-novel and ends up jumping trough different alternate universes while evading entities which make sure that is not supposed to happen. The Accidental Time-Machine is a riff on Orson Welles, with the protagonist accidentally assembling a time-machine and jumping long distances into the future. Haldeman does what Haldeman does best and describes the weird and actually quite interesting civilizations that have developed in the increasingly far future, and how they came to be. Nothing ever comes from these, as they are treated as curiosities without any deeper meaning, and are as quickly abandonned as they are introduced. As usual the story ends by barely set-up intervention of a higher power. The Marsbound-Trilogy is a weird beast as well. Marsbound introduces the world with its Mars-colony and systems in place to support, as well as how it handles finding an intelligent lifeform. The sequel swaps this out for a decade-long deep-space mission to find another Alien entity, and Earthbound takes place entirely in a post-apocalyptic Earth where all electricity has been shut off by an alien species. Set in modern day. Main character is being framed for murder and tries to solve the mystery of it. Ends even more abruptly than the others. This is treated the same vein as other “weird” stuff is treated. “Huh look at this weird future I guess this is it now”. The entirety of humanity turning bisexual is pointed out as different and accepted with resignation as the new default. This is unlike Yoon Ha Lee‘s Ninefox Gambit, where all sexualities and genders are treated as “regular” without any need to point it out. As most of his works were created decades ago this seems ok enough, and is still lightyears aheads of Orson Scott Card‘s absencence of everything but hetero-marriage. Most of his novels follow this formula. There is a series of events (mostly happening to the protagonist, and less driven by them), and then it ends. The thing is, in certain settings it works really well. It works in sci-fi, and it works really well in military sci-fi. It might be the only style that allows Forever War to be so brilliant. Go read Forever War. If you want more afterwards, check out the others. I just stumbled on @RaphKoster‘s article on the original planned Jedi-Gameplay from #StarWarsGalaxies #SWG. Go check it out, it’s #gamedev-gold! The article details ways they tried to accomplish that with gameplay. One (discarded) option was that everyone could be a jedi, but once you use force-powers the empire would come after you in increasingly unfair numbers. Additionally your Jedi would have to endure permadeath. If you die as a Jedi, you are dead forever. #SWG had 30+ “professions”. People would become bounty hunters, animal tamers, dancers, cooks, form guilds, etc. They just did that and lived in the world, and no-one cared about Jedi. No-one ever saw any, and they were just legends. Just like in that period in StarWars. Then, 6 months after the game came out, the first Jedi appeared. How did she manage it? She didn’t even know it herself. No “you achieved Jedi Status” marker popped up in the moment, it was just there at one point. The player posted a list of all the things she accomplished, incl. visiting all planets, never marrying, reaching a certain level, and about 20 more things. People were scrambling to find out how she became and Jedi and tried to reproduce these actions, but nobody could figure it out. So they went back to living in the world, being dancers, cooks, traders, etc. What was going on under the hood is that every player had 5 professions randomly “chosen” for them, without them ever knowing. Once these were maxed out they would become a Jedi, but they would be only told when logging in next time. It was good. People loved the game, and Jedi were exceedingly rare and mythical. This kind of game would not be built today. The illusion was broken, and now all people wanted to do was to become a jedi. There were many, and they were not mythical any longer. Eventually development caved and an entire addon called “Trials of Obi-Wan” was released, which was centered on Jedi. A MONTH later the New Game Expansion was released, which was practically a new game, in which “Jedi” was a starting profession, and utterly mundane. 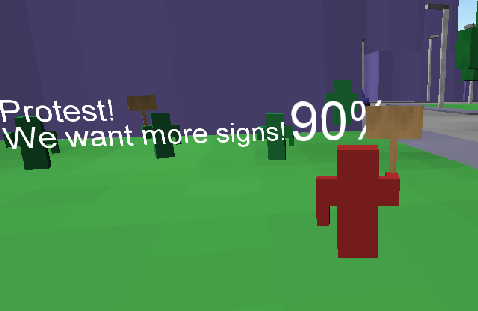 I just made Let’s Protest, my Molyjam 2012 game, playable again. Go check it out if you haven’t yet! It was built for a Unity WebPlayer, whose support has been discontinued. Most of my games have been built for that, and a lot of them are sadly now defunct. Dealing with Plugins & Libraries. This makes me happy I was anxious in the past about overly relying on 3rd-party-elements outside my understanding, and I was totally right. A lot of old plugins have now non-accepted code or just stopped working. Even if they are still supported getting the newest version and integrating them would take a noticable amount of time. Not to mention tools which might have changed their pricing and have thus become more expensive to acquire. This can become very time-intensive. At best this entire process takes 2-3 hours. At worst (as it was 6 months ago for another game) it took me a month to figure out a super-slow publishing issue. This is why it is infeasible for me to re-release all of those old titles, even though I would love to.